Timberhaven uses primarily Eastern White Pine harvested from across the northeastern United States for their log homes and cabins. These forests grow slow, and produce dense, strong wood for their manufacturing. 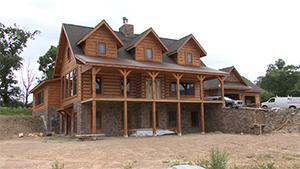 Timberhaven dries their wood in a kiln to control its moisture content, and cuts every log for an exact fit. The parts are labeled and shipped out along with a materials list that tells the customer where each part goes in the custom home.